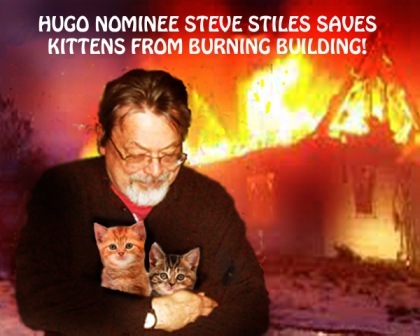 Hugo-nominated fan artist Steve Stiles has started two blogs to help fans remember that he is – Hugo nominated! One look at Steve’s Okay, Actually It’s A Blog: A Site For Sore Eyes on Tumblr offers immediate proof that this good guy deserves your vote. The copious examples of his excellent fanzine and comic art help too, of course. Once again (14 times!) I’ve been nominated for a Hugo: this photo shows what a fine humanitarian I am! Hugo nominee Steve Stiles despises the NRA at least six hours every day. Good grief, Steve, no wonder Larry Correia didn’t include you on his Hugo recommendation list. You coulda been a contender! Next year add a photo of yourself holding one of these assault-rifle-and-chain-saw combos and you won’t believe how many votes you’ll get. Ah, why not? How many nominations did Larry Corriea get before he began to beg for ballot stuffing? Thiough I won’t take thet photo too seriously. Looks photoshopped. Mr. Correia has been asking his fans for a Hugo since the day he asked his fans for a Hugo *and* a Campbell, (not one for false modesty, is Larry.) The “strike a bold and independent blow against the liberals” rhetoric and the “conservative fan exchange program” are later additions that have brought him greater visibility. At any rate, I am in the process of reading the “hate” slate; I can certainly have a look at Steve Stiles’ websites also. It seems only fair. The sense of humor displayed is far greater.